Mountain High’s VIP Season Pass is the best value in Southern California with prices up to 53% off beginning August 31st. For just $349 (Reg $749) guests enjoy an entire season of skiing or snowboarding at Southern California’s closest winter resort plus three FREE days at 11 other Powder Alliance areas. That’s 33 FREE tickets! These resorts include Crested Butte, Snowbasin Resort, Sierra-at-Tahoe, Stevens Pass, Timberline, Schweitzer, China Peak, Arizona Snowbowl, Mt Hood Skibowl, Angel Fire Resort, and Bridger Bowl. Imagine skiing some of the best powder stashes in the West all for FREE with your Mountain High VIP Season Pass. Plus, if guests order by September 10th, they also receive a FREE Buddy Ticket to Mountain High worth $69.00. VIP Season Passes are good any day or night Mountain High is open with no restrictions. Other benefits include FREE tickets to the North Pole Tubing Park, early-ups on select days, monthly discounts for family and friends, $10 Off Adult ski or snowboard lessons, 10% Off non-sale retail items, and the ability to track your days ridden and share them with friends. As a Powder Alliance member, you are free to ski about the Western United States and find the best snow conditions & nearly limitless vertical feet. There are no membership fees, no collective pass prices, no additional charges of any kind. Simply show your 2013/14 VIP Season Pass and receive three FREE tickets any Sunday through Friday, non-holiday, at participating areas. 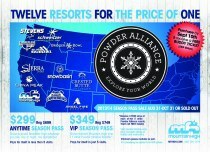 Please visit http://www.powderalliance.com/ for a complete listing of dates and restrictions plus additional resort benefits. So, go explore 3,000 acres at Snowbasin Resort, UT, dive deep into 480 inches of fresh snow annually at Stevens Pass, or ski into May at Timberline in Oregon. These benefits are FREE to 2013/14 VIP Season Pass holders of Mountain High. For those looking to save even more money, Mountain High offers a traditional Anytime Season Pass for just $299 beginning August 31st. With this, guests can still ski or snowboard any day or night the resort is open and record their statistics but there are no additional discounts or benefits. The $299 Anytime Season Pass pays for itself in less than 5 visits. Children’s passes for ages 7 to 12 are also available beginning at $199 with the purchase of an adult season pass and $219 without. Kids six and under ski FREE when accompanied by a paying adult. Ride the longest high-speed quad in the region at Mountain High’s East Resort. Ski under the stars at Mountain High’s West Resort. Or take the kids on an exciting winter adventure at the North Resort. Your season pass is good at all three areas and this year Mountain High has added a new Burton LTR Training Center, increased snowmaking, an updated smart phone app, new terrain features, and an enhanced family atmosphere. Mountain High’s Anytime Season Pass Sale takes place August 31st through October 31st, 2013. As an added bonus, guests who purchase by September 10th also receive a FREE Buddy Ticket worth $69.00. Passes may be purchased online http://www.mthigh.com/season-pass-sale, at the resort, and by phone at 888 754 7878. Please note there is a $10 processing for all new passes purchased.